This is a great tool for building fluency! This is a Placemat with 3 phoneme words. I recommend using Placemat: (1) send in Homework Folder (reinforcement at home). (2) use for small group, intervention, tutorials, etc. 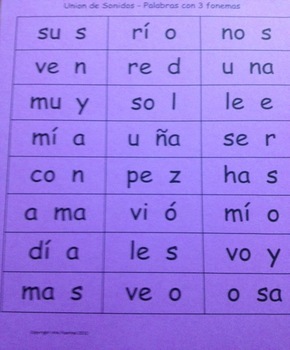 (3) use during whole group instruction; take time to go over these words daily with your students. (4) use as a teacher assessment. You can do a weekly assessment to see which words students can read and keep track of their progress. I recommend BINGO (3 fonemas) & Dice Game (3 fonemas). 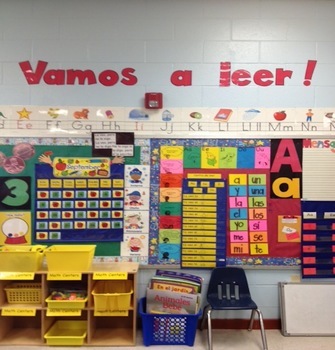 Once students are fluently blending 3 phonemes, I suggest Palabras de 2 Silabas!